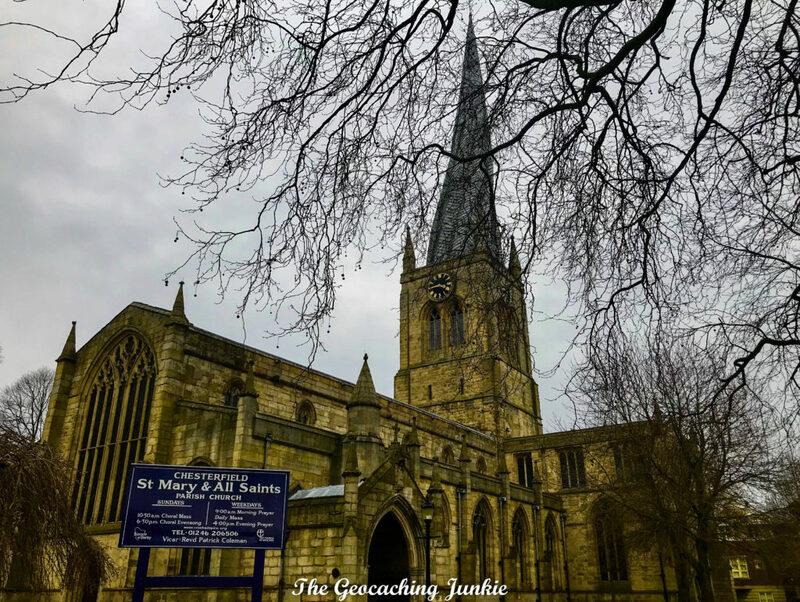 Whenever we visit my husband’s family in Derbyshire, we usually spend a few hours in the market town of Chesterfield, which means I’ve basically cleared out the geocaches within walking distance of the town centre. 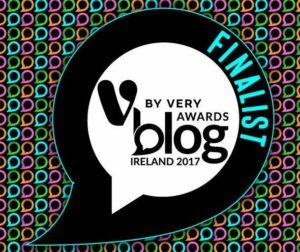 I was very pleased to see a virtual reward cache published there in October 2017. I finally managed to visit the cache earlier this year and thoroughly enjoyed completing the logging requirements. 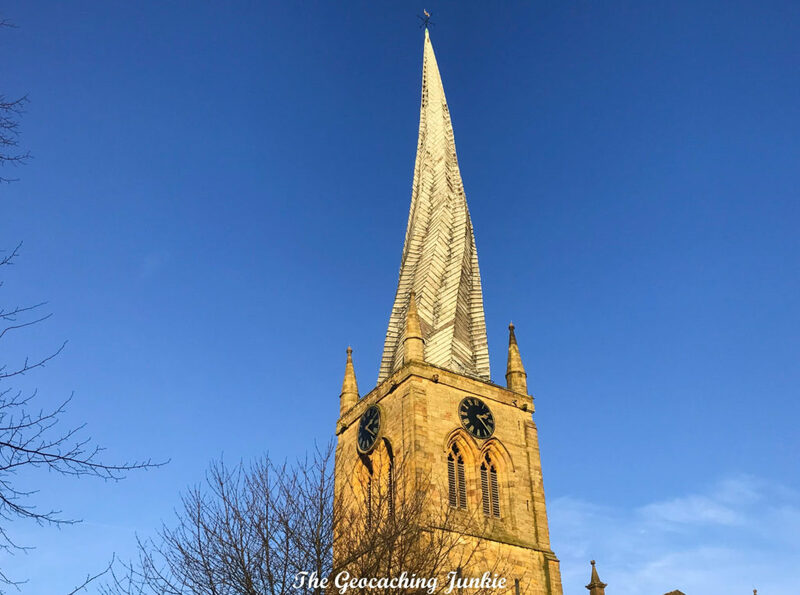 The cache – Crooked Spire -Celebrating Spire67’s 50th Birthday (GC7B8JR) – is located at the Church of Saint Mary and All Saints. The Grade I listed building is the largest church in Derbyshire and is most well-known for its twisted and leaning spire. It’s this contorted steeple that has given the church its common nickname, the ‘Crooked Spire‘. So why is it twisted? Local legend has it that the steeple bent out of shape in surprise when a virgin was married at the church. The story continues that if another virgin is married there, it will straighten out once again. 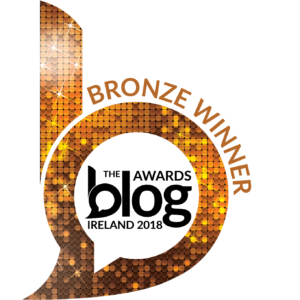 Another folk tale goes that the devil sat atop the spire and wrapped his tail around it. When the church bells rang, he tried to run in fright but his tail was still wound around the tower, causing it to contort. During the day, the south side of the tower heats up in the sun, causing the lead there to expand faster than that on the north side. This imposes a twisting movement due to the pattern in which the 33 tonnes of lead were applied. Visits to the tower cost £6 per adult and £4 per child. 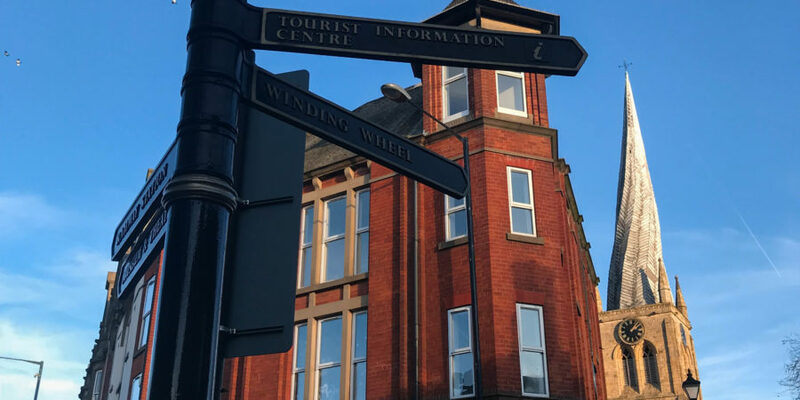 The Crooked Spire website is updated weekly with planned tours for the coming week, including the timings (currently 2:30pm on days the tour runs). Our guide was the animated and very knowledgeable Dave, who began with a forewarning that there were 171 steps to the base of the tower and the winding stone stairs were narrow in places. 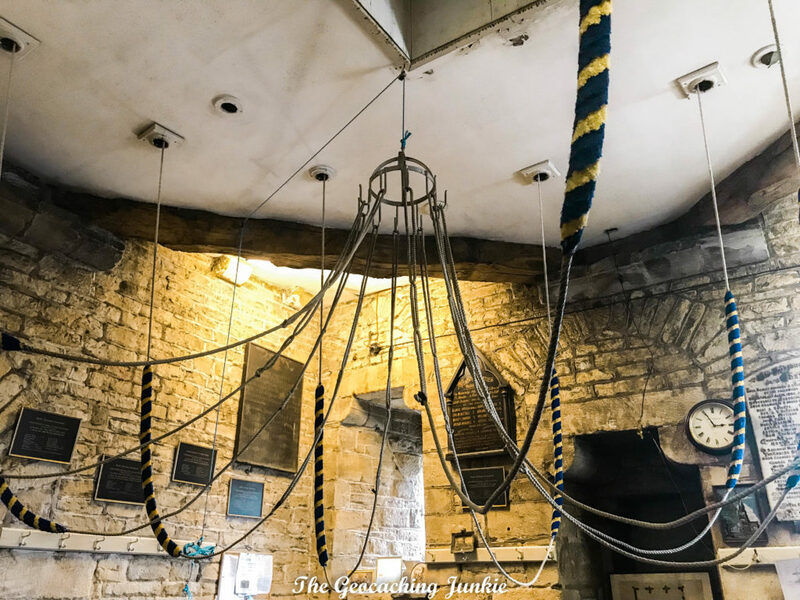 The 171-step climb was broken up in to stops on three floors, and the first stop was where the bell ringers’ ropes are located. The next floor contained the impressive bells themselves. Dave enthusiastically talked us through the local history of Chesterfield, before providing lots of information about the church itself. 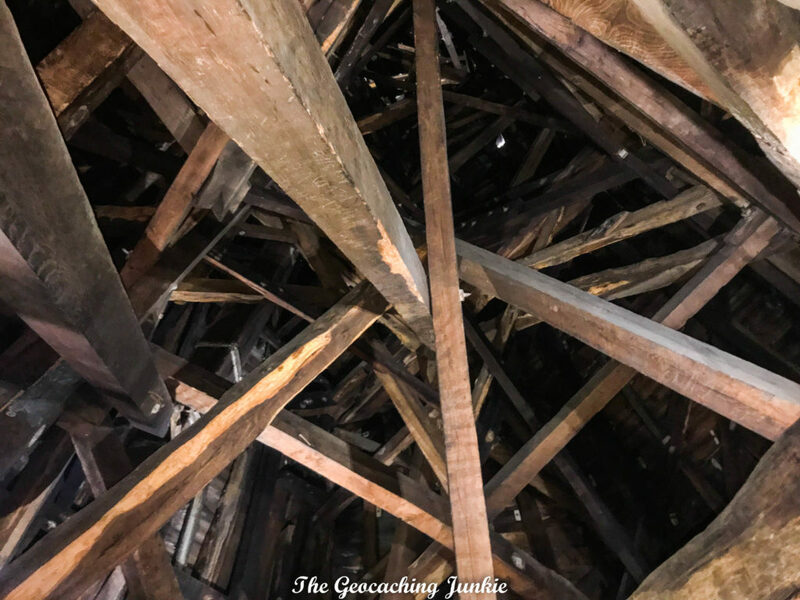 The next stop on the tour is the top floor, where you can stand beneath the twisted wooden beams supporting the tower. 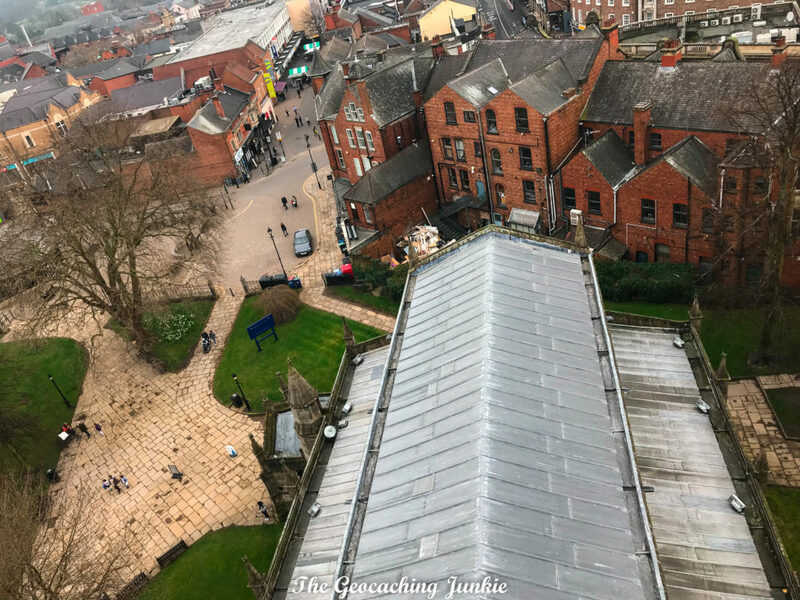 A short climb up a wooden ladder and we were standing outside on the tower’s parapet, taking in the great views over Chesterfield and beyond. There are two options for completing the logging requirements for the virtual cache. 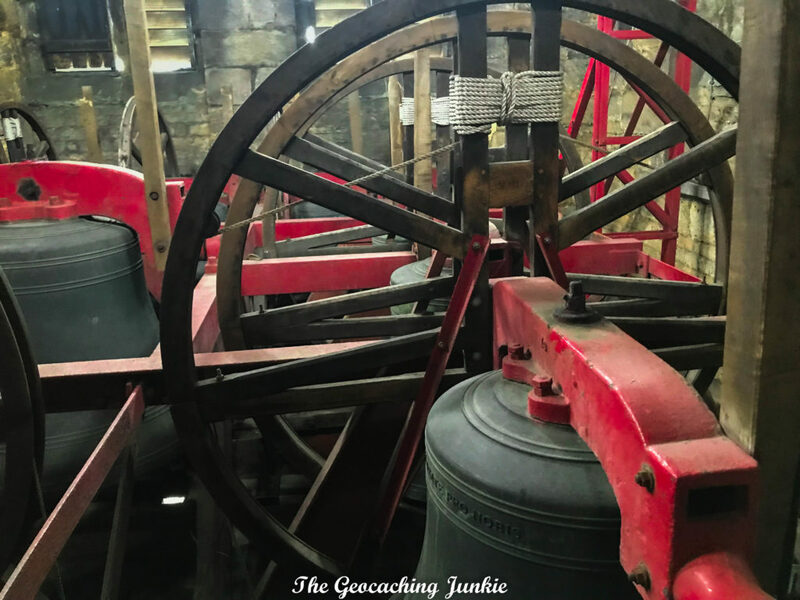 The first is a type of treasure hunt around the church and grounds, where seekers look for 18 pictured items and must identify the one that is not there, along with answering another specific question and posting a picture near the church’s organ pipes. 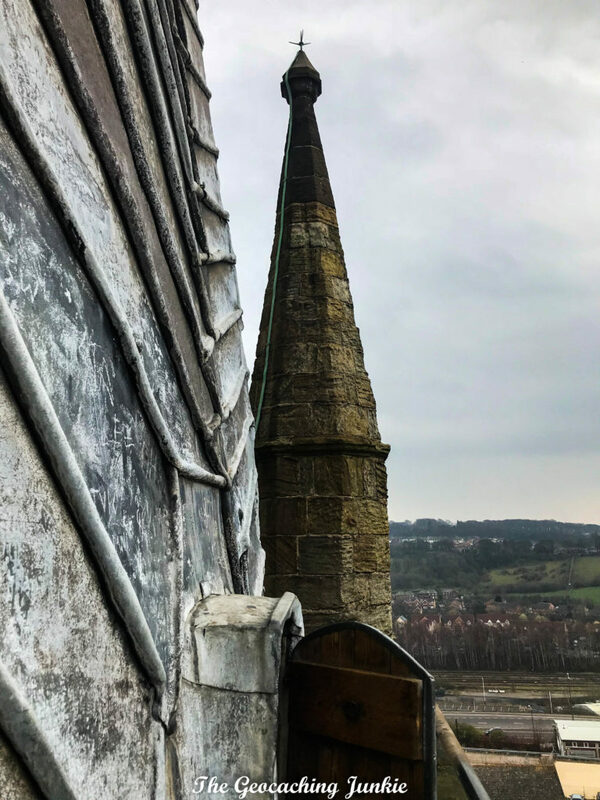 The second logging option is to take the tour and answer two questions that can only be discovered on the way up to the tower, as well as posting a picture from the roof. It’s great to have both options available as the tours don’t take place every day, and even then, there’s only one per day. I am very glad we were able to take the tour and it’s well worth the £6 fee charged. 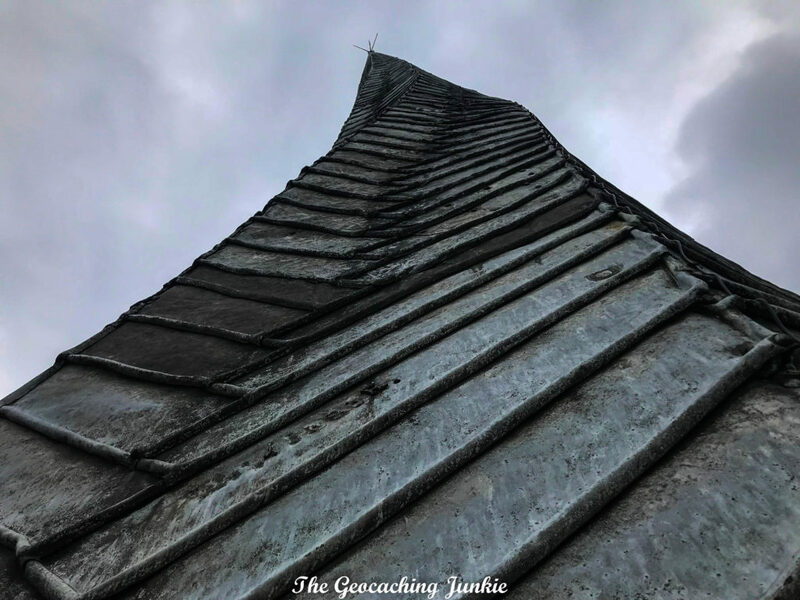 I always try to seek out virtual caches when I’m travelling, mostly because we don’t have many in Ireland so it’s a chance to boost my number of virtuals found. 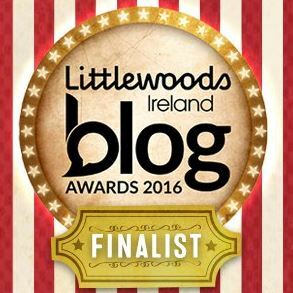 Often – although not always – virtual caches really add to my experience of a location. I can safely say I would not have taken this tour without the cache. Have you found any of the new virtual reward caches? Which is your favourite and why?